The wood preserve (butter) that I used on the chairs in my previous post is made of pure beeswax, and mineral oil. I have included the recipe below. It makes a large batch, I gave one as a gift, used one jar and still have two jelly jars left. This photo shows a close up of the wood I used it on, what I did not use it on and the jar of wood butter. It's worth taking the time to make, I can’t believe how many things I have used it on. You will be amazed on how it brings life back into dried out wood. 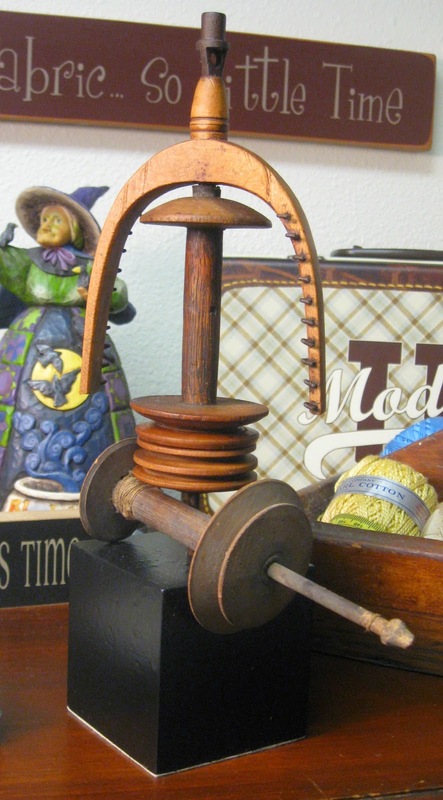 I used the wood preserve on this spinning wheel flyer I found it was very dirty and dried out beyond belief. The spool on the bottom is not treated and here is the flyer treated. I cleaned the wood and used the wood preserve and thought it turned out amazing! It was so pretty that I painted a block black and drilled a hole to mount and display this piece. I love to knit and really enjoy yarn; even though I have never used a spinning wheel it is a nice piece to add to my craft room. A terrific homemade product to use for all of your wood kitchen products from wooden spoons to cutting boards. 8 ounces pure beeswax - measured dry. One package of the pellets that I purchased weighed 16 ounces and I used half a package at a time. 32 ounces of mineral oil - typically packaged with 16 liquid ounces per container so I used 2 containers. Place your beeswax inside a 2 quart glass measuring cup or a 1 quart glass jar; set the glass into the gently boiling water. Place the container(s) of mineral oil inside another medium saucepan filled with water and heat to low. The mineral oil just needs to be warmed to mix with the beeswax; no need for a rolling boil. Once all the wax has melted, turn off the stove and carefully add the warmed mineral oil to the beeswax; stirring with a spoon to combine. Using a towel around the handle of the measuring cup, carefully pour the liquid into each jar fit with the canning funnel; filling them almost to the top. Finish filling all jars and wait for to cool and firm up before using. 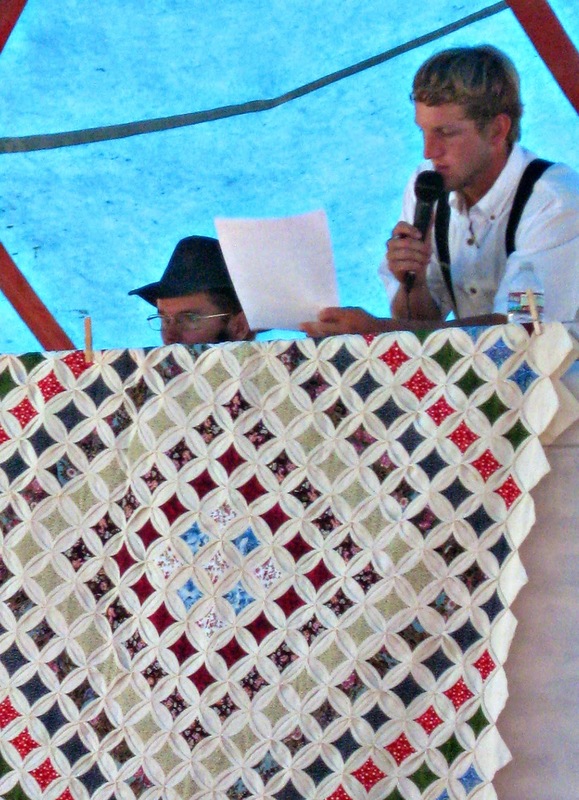 We starting going to the Amish auction in 2006, my dad and my two girls have attended every year and have always brought something fun home. They have their auction the second Saturday in July and this year's auction was very hot – about 98˚. The auction is very busy they usually have three auctioneers going at the same time with plants, handmade quilts, and miscellaneous items. They also sell buildings and handmade furniture. 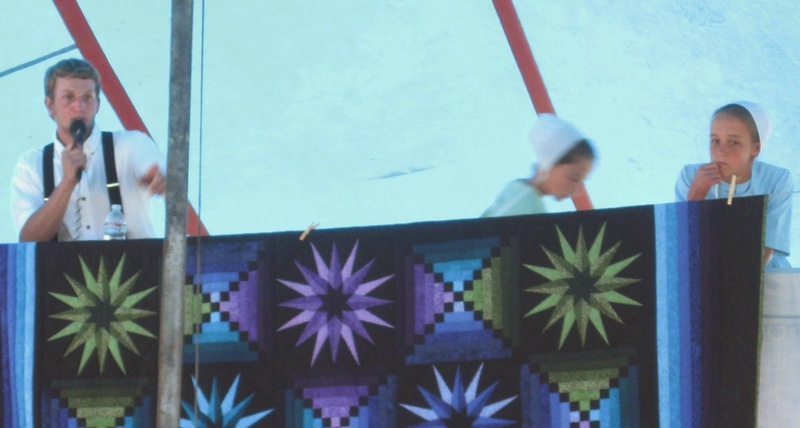 The proceeds from the auction go to the Amish school. One of our favorite things is lunch…they offer a homemade chicken dinner with the works you can also purchase homemade ice cream for dessert. 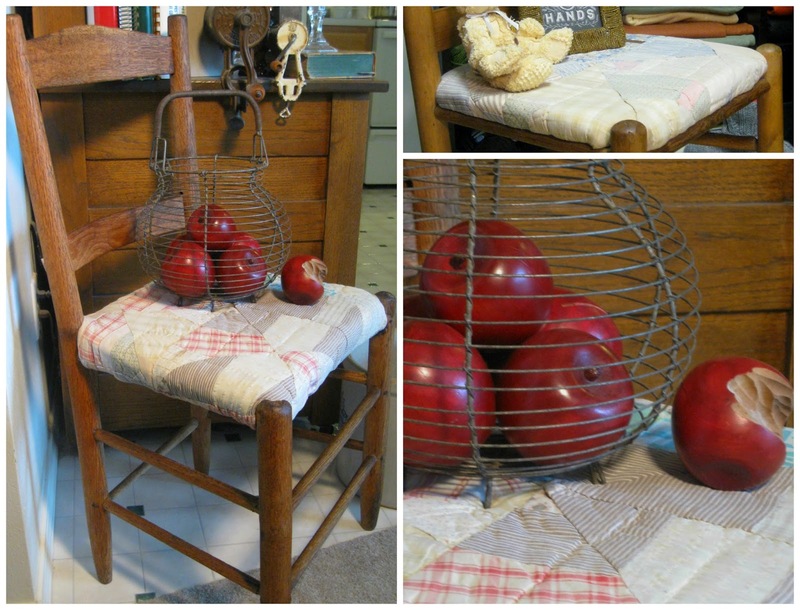 This year I bought these two chairs the seats are covered with old quilts. They were a little dirty and the wood was dried out so I used my wood preserve I made earlier this year. I cleaned and polished them up a little; they add a nice touch to my kitchen and sewing room. Last year I purchased this black vintage wooden expandable sewing chest and I have all of my knitting items organized now. I love this box! Don’t just Pin it … do it! Here is the photo of items before we started. 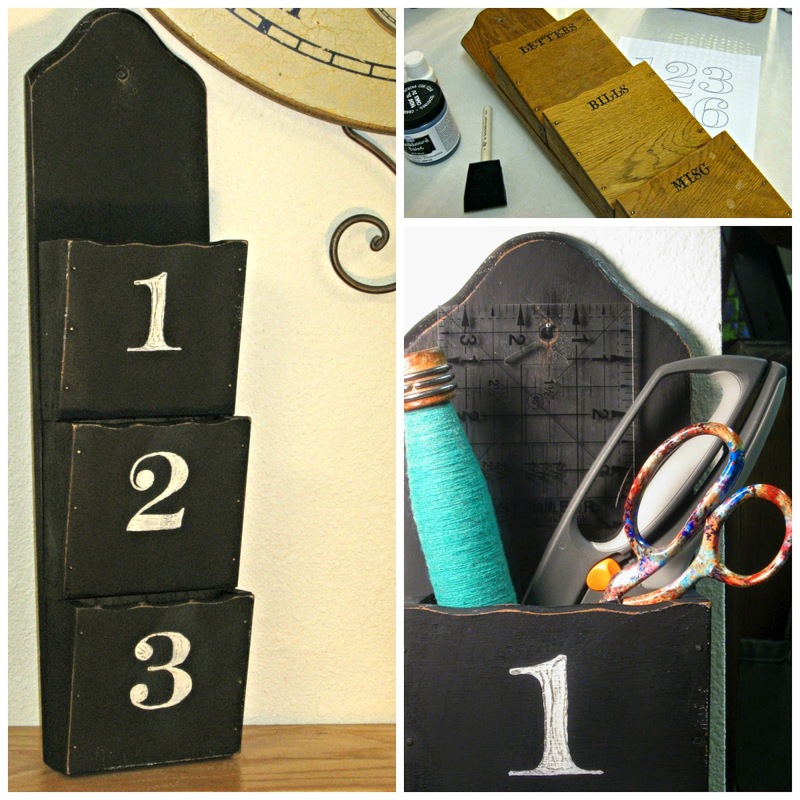 This project is very popular on Pinterest. We are taking advantage of the dollar store and purchasing candle holders and glassware to make useful containers. I found the one container with the handle at the World Market for $2.99. The one larger dish is from a garage sale, which was chipped but still useful. So the total cost for each piece varies from $1.25 to $4.00 depending on the piece you choose for the top. Here is my daughter finding the center of the glassware, which is important if you want them to look good. She marked off the area using a dry erase marker then put the center dot in the inside of the container and wiped off the bottom. 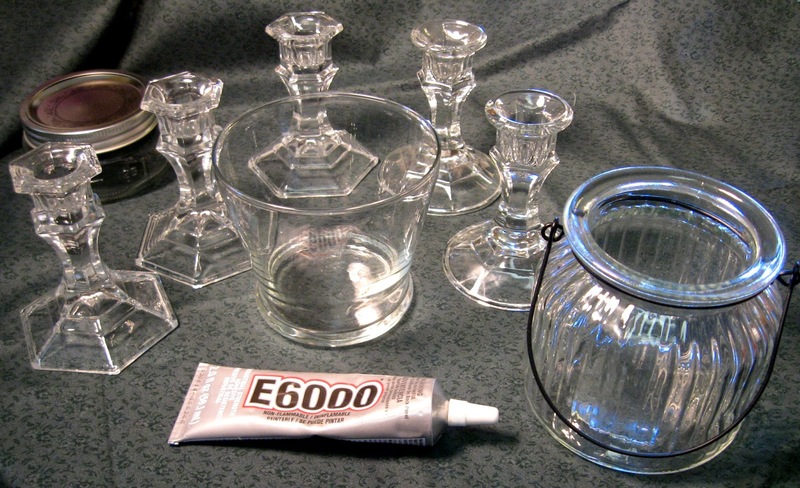 The helpful hardware man at Ace suggested the E-6000 glue – works like a charm! Once you start to glue on you have two minutes to stick the items together and it takes 72 hours for the project to dry completely. This was a quick and fun project that you can do for gifts or for yourself! Here is an update on my last project I have it hung up in my sewing room. I’m happy with the location and how it looks; now I can find my scissors!